I do so many different things to my natural hair. One of the things that I love the most about being natural is how versatile it is. I like it straightened, I like it blown out, big, and I enjoy my wash and gos! When I wear a wash and go it is usually more about convenience. If I wear the hairstyle I don’t want to have to do a lot to my hair throughout the week. I definitely don’t want to have to co wash my hair daily. My goal is to make my wash and go last at least 3-5 days, and if I can go 7 days my week has been phenomenal! As I type this I am currently on day 5 of my wash and go, so it looks like I am going to make it to day 6! Alright nooooow! I find that using a product with hold helps me maintain my wash and go for several days. On day one there is a little crunch, but I work it out just a little with my extra virgin olive oil. The goal is to leave a little crunch so that my hair is able to hold up for several days. Throughout the week, the hair gets softer and softer until the crunch is completely gone. Usually by this time I have made it to day 3. It is very important to make sure that you maintain your hair every night. I like to do a high ponytail also known as the pineapple or a high bun. I wrap my edges with a satin scarf. This keeps the curls from getting frizzy during the night while I sleep, and it also stretches the curls a little. Both things are great for me. When I do not tie my hair down, I wake up with hair that is stuck to my head, shrunken, and extremely tangled. In the morning I take down my ponytail and apply a little oil to my hair to wake it up. It softens the hair and also adds shine. I try to keep from adding water to my hair daily. Water usually causes my hair to shrink and frizz. This is horrible when you want your hair to last for several days. It is also not necessary, because my hair is usually able to stay moisturized at least up to five days. (Optional): If necessary I will lightly spritz my hair with water. Sometimes the hair does start to get dry and lose it’s movement the further I get into the week. This really depends on my activities and also my night maintenance. I like to spritz my hair with the water, shake and go. 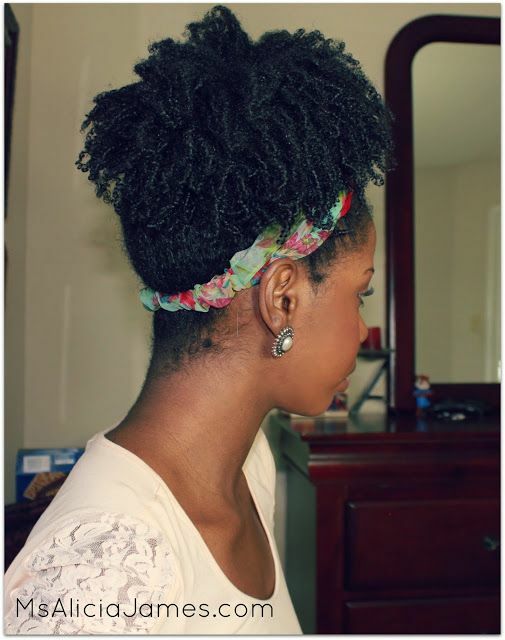 This is also great for those times when the hair gets a little bit too stretched out with the pineapple method. When this happens to me, I just spritz a little water on the back part of my hair to get it to jump back into place. Remember spritz lightly, because the goal is only to encourage the curls to bounce back into place, I spritz lightly so that I don't have to walk out the door with a wet head and wet clothes. How do you get your wash and go to last?